Discussion in 'Accessories' started by evan_bedford|2, Jul 19, 2018. Maybe this is old hat. I dunno. But I strung a long loop of rope from the top of a monopod down to the ground to form a rough triangle. Apex at the top of the monopod, and the two base corners being spread out and stepped on by my feet. Then I pushed the monopod forward so as to create tension on the rope, and compression on the monopod. Edit: I forgot to mention that the base of the rope was rearward of the point of the monopod (therefore, another rough triangle demarcated on the ground). Without the rope, I was able to get a relatively sharp shot at 1/15 second. With the rope, I got it down to 1/8 second. Not very scientific, since I only did one trial with each method (but with several shots in each from at least 1 second down to 1/30 second. The initial image is without the rope. It also compares the same vantage point made months earlier with a tripod. And here's the result with the rope. Even better using the ten second timer, instead of having my finger press the shutter. Somewhat anomalous results (to be expected) with the one second and half second turning out sharper than the quarter second. However, I can guarantee that I'd never be able to get a reasonably sharp one second shot with just the monopod without the rope. A very decent old trick, useful if a tripod isn't available. Similarly you can use a shoulder strap pushing the monopod away as used to be taught to some military/police units when using sub machine guns. Fact of the matter, you can buy a complete H&K MP 5 sling on line for under $15. Full hardware, probably work a treat. I still have a couple made of chain, both plastic and metal, using speed links and a couple of 1/4x20 eye bolts; about $20 into both versions. I still keep one in my "go" bag. Hmm. Presumably, if that works (and you don't mind tension on your tripod mount), it should be possible to make a "spreader" that you can stand on, then use three pieces of light inextensible string (of the kind my maths teacher used to use when tethering elephants in Newtonian mechanics, but more practically fishing line) to form a tripod. I've heard of using a single tensioned string as a cheap monopod (which still leaves you open to rotating around the base, and is less stable than an actual monopod because your legs aren't spread), but not so much as an actual tripod. You'd need a fair spread (and upward force) to give you decent rigidity, but that feels like a solvable problem, and you presumably wouldn't need as much as the height of a typical tripod. Then you'd still have the problem of the camera rotating, rather than just shifting (which is usually a bigger problem). But if you could separately tether both the lens foot and the camera base to the same spreader, you might be able to fix this as well. Or have an extended camera foot, if the lens doesn't have one. A monopod minimizes vertical translation and tilt, but leaves yaw, lateral translation and axial translation. A string only reduces vertical translation. Since camera shake is random in all directions, the effectiveness of either is questionable. The best use of a monopod is to support a heavy lens, as for sports photography. For normal distances (e.g., 10xF) translation motion can largely be ignored, but tilt and yaw remain significant. The right monopod might serve other uses, if constructed and used properly (q.v., Cane-Fu). Mine are made of 18 layers of carbon fiber or hickory. Ed: With a monopod I believe the advice is to lock the legs, and try to form a tripod by leaning on the monopod. Not that I can lean very hard on the cheap ones I've got. It doesn't help much with yaw, though. Other than that you're pulling rather than pushing, a "string tripod" arrangement ought to work just as well as a way to avoid translation. 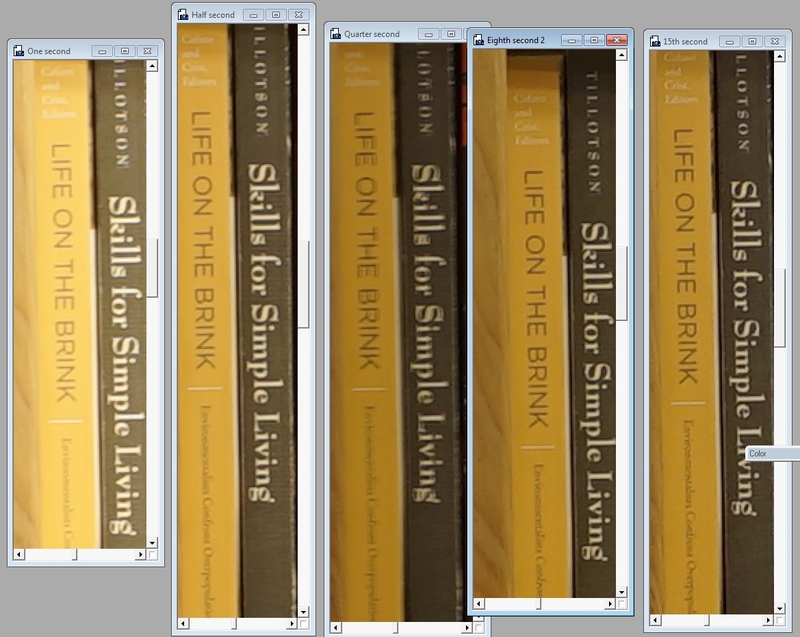 Rotations are another matter, but that's why I was mooting the idea of tethering the lens mount and camera separately. It's not going to make my carbon tripod think it's out of a job, but I'd expect some degree of usefulness out of it. Of course, you're then down to difficulties trying to change the aim, which is the same problem multi-tripod solutions have. For a long time, I carried a plastic-filled bean bag (real beans will stop you at the border, possibly with an hefty civil fine). I would put it on top of a fence or railing, then nestle the camera in it and shoot away. In the long run, tripods proved more practical, and even tripods are largely moot with in-body image stabilization. Depends what you're doing, Ed. Rockwell claimed that tripods were irrelevant since on a dSLR you can "just raise the ISO" - but there's obviously a cost to doing that. It's always a matter of degree; IBIS (or other VR/IS/OS/VC/OIS) might get you down to a 1/20s exposure rather than 1/100s, but if you want a 2s exposure then you still need mechanical support. I do tend only to bother carrying one if I'm going on a serious photography expedition, though. I would have guessed there was some benefit, but you have to carry it around (not difficult), set it up, and faf about getting the length correct etc. Marginal increase over a monopod, so you could 'do a Rockwell' and increase ISO marginally to get the same effect, even if there is one. Raising the ISO is one solution. In-body image stabilization (IBIS) is another. It's always a balance between noise and clarity. IBIS is not perfect, and there is a distinct advantage in using a tripod for lenses longer than 50 mm, and for closeups with any lens. Even high shutter speeds are not always enough to offset the pixel-level instability of image stabilization. That is inherent in inertia-controlled servo systems. Fortunately, Sony cameras seem to recognize use of a tripod, so it's not absolutely necessary to turn IBIS off. I do admit that, though I have some gorillapods of varying sizes, I relatively rarely use them for camera support. They're not all that stable, but mostly I find an inconvenient lack of trees or other support structures where I want to put the camera. I've rarely used bean bag "pods" for the same reason, though I have a couple. On the other hand, even a very flimsy tripod like a Tamrac ZipShot or a Velbon VTP-787 will sometimes just about hold a big dSLR, if you use mirror lock up and shield from the wind. I've kept the camera strap around my neck when doing so just in case of collapse, though. Anyway: IBIS good (although not much help for framing if you have a dSLR - has anyone ever tried to stabilise the mirror? ), lens stabilisation also good, support good, high ISO good, fast lenses good. Combination, better. Hmm. Presumably, if that works (and you don't mind tension on your tripod mount), it should be possible to make a "spreader" that you can stand on, then use three pieces of light inextensible string (of the kind my maths teacher used to use when tethering elephants in Newtonian mechanics, but more practically fishing line) to form a tripod. A triangle such that the three strings or chains don't all attach at one point would give some damping on rotation. When I am out without a tripod, or one isn't allowed, I find something to lean on, or to lean the camera against. I was recently at Butchart Gardens at night, and found some things to lean against, though not so many as I might have liked. No tripod, monopod, chain, or string.